Each Postion Such As - Eligibility Criteria, Qualifications, Age Limit, Selection Procedure Before Applying. 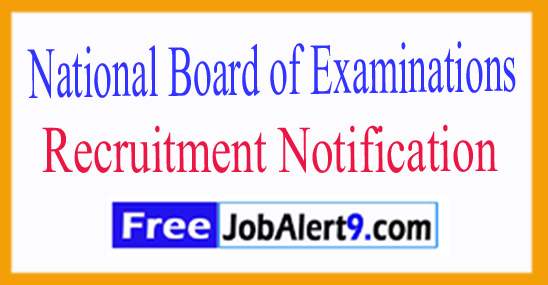 National Board of Examinations (NBE) Recruitment 2017. Candidates Maximum Age Should Not Exceed 27 Years. Salary And Grade Pay Scale: INR Rs.5200 - 20200/- With 1900/- Grade Pay. Candidates Must Pass Bachelor Degree or its Equivalent Qualification From A Recognized Board / University. 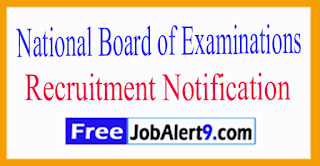 Candidates Can Download Application Form Through Official Website (http://www.natboard.edu.in). After Filling The Application Form, Candidate Must Send Hard By Copies of Application Along with Relevant Testimonials Mentioned In Detailed Advertisement to The Following Address Before / within 90 Days. Assistant Director (Admn. ), National Board of Examinations, Medical Enclave, Mahatma Gandhi Marg. (Ring Road), Ansari Nagar, New Delhi-110029. Important Dates : Last Date for Receiving of Offline Application Form Is: within 90 Days .